Programmer Sally: "So, what are you going to do today Bob?" Programmer Bob: "I'm not happy with the file baz.clj residing in my/ns. So I'm going to go to line 96 and change 2 to 42. I've been thinking about deleting line 124. If I have time, I'm also going to insert some text I've been working on at line 64." The resulting database is highly programmable, and can serve as infrastructure for editors, IDEs, code browsing, analysis and documentation tools. codeq is open source (EPL), and on github. It works with Datomic Free. We love Git. We use it, and by now so do most of you. Used conservatively, Git provides a good basis for information management (it keeps everything!). But it is important to understand Git's limits. Without a live connection to the editors, merge tools etc that munge the files, Git is relegated to simply discovering what has changed in the filesystem, and wisely just stores new stuff, using content-based addressing to determine what is new. Any further information we get from such a recording of novelty has to be derived. 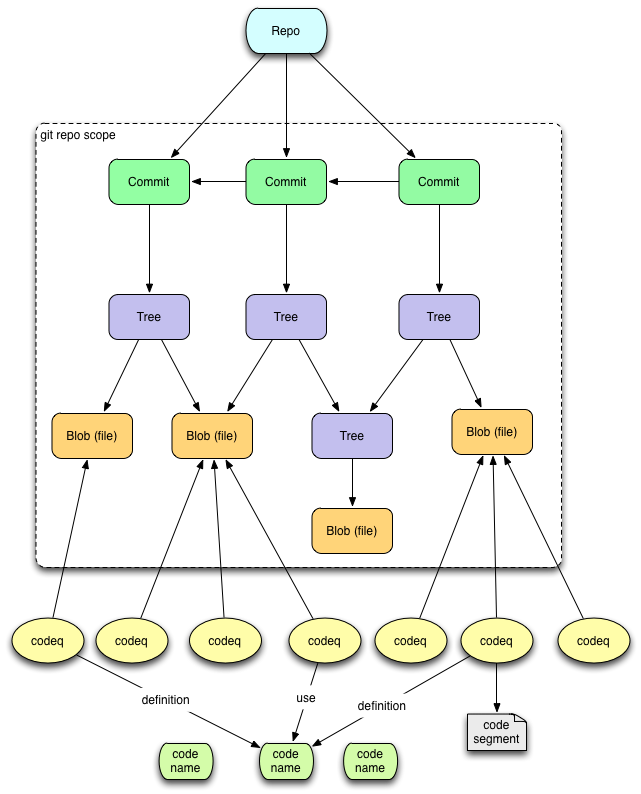 Diffs derive mechanical change information, and tree and file diffs are at the core of Git's facilities. Language-aware analyses can derive change information co-aligned with program semantics. Git looks in directories and finds files, names them by the SHAs of their contents, and encodes their relationship to the enclosing tree by filename. During the import phase, codeq pretty much transfers Git's model intact. During the analysis phase, codeq looks in files and finds code segments, names them by their SHAs, and encodes their relationship to the enclosing file by line+column location. It further associates them with programmatic names and semantics (e.g. definition, or usage), if possible. We call this semantic segment a codeq. Thus, one way to understand codeq is as an extension of the git model and tree down to a finer granularity, aligned to program semantics. In Git, every repo is an island. When trying to understand the interactions across your entire program, including the many libraries it uses, each with their own Git repo, it becomes useful to combine repo information in a single database. The beauty of content-based addressing and globally unique namespacing (as done by e.g. Java and Clojure) is that such merging is conflict-free. So, codeq supports the importation of multiple repos into the same database and keeps them sorted, superimposing a level above the Git model. Now we can consider a particular scenario - a programmer edits a file, changing one function definition and inserting another. From the Git perspective, the two files are different blobs, with different SHAs, in different trees under the same name. Anything else it tells you about what has changed is done via dynamic diffing, and is usually expressed in terms of lines and blocks of text. Since we know (some of) these files are programs, and they are stored immutably, it seems worthwhile to perform a one-time analysis in order to track change more finely. codeq will break down the top level of the file into the corresponding program-language units (e.g. for Clojure, mostly function-defining forms). It gives each a SHA (if the block of code has never been seen before). It will then look inside and try to determine what the code is about (in context - since the same code can appear e.g. in different namespaces and thus name different things). The 'meaning' is normally some reference to a namespaced program identity, and for some purpose (definition, use). So a codeq encodes the location of a code segment in a file, and its semantics. This importation and analysis is not a one-shot thing. You continue to use Git normally. You can go back later and import your newer changes from Git, or perform new or enhanced analyses. Due to the first-class nature of Datomic transactions, the codeq database knows what has happened to it, what has been imported, what analyses have been run, what schemas have been installed etc. 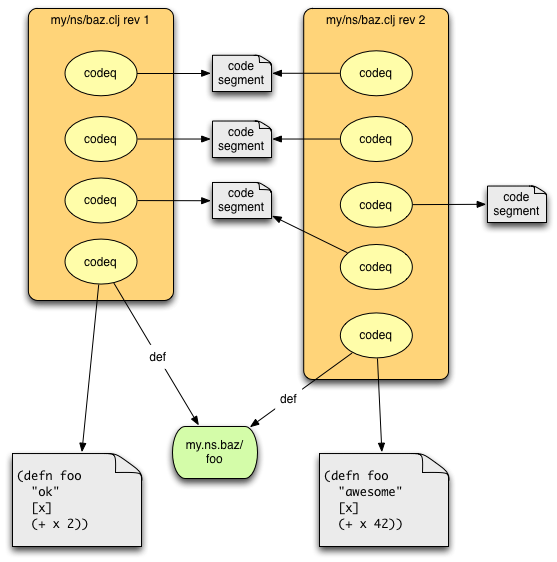 Git has a powerful engine - durable persistent data structures with structural sharing and some fast C code that manipulates them. Unfortunately, it is hidden behind a plethora of command line utilities each of which has a boatload of options and a variety of outputs - let's have a parsing party! If you don't know Datalog, it's worth the 11 minutes it will take you to learn it. I hope this gives you a sense of the motivation for codeq, and some excitement for trying it out. It's still early days, and we are definitely looking for help in enhancing the analysis, integrating with tools, supporting other languages etc.